Ear Of Corn 8 in. x 10 in. Oil On Panel - BID ON OR BUY THIS PAINTING. This painting is the result of a trip to the farmers market over the weekend. I put this particular ear outside to dry out on Sunday and I'm really glad that I did. I really like the look of it after it lost some of the green on the husk. 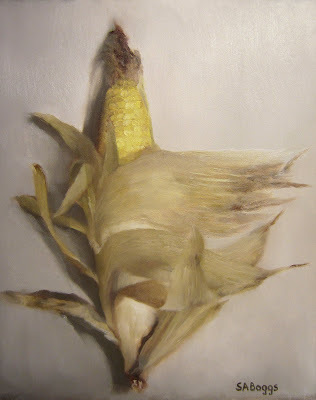 I wasn't so much after trying to make this a painting of a food item, for me this was more of a portrait of this specific ear of corn. I hope that you enjoy it.